Summary: The second installment slows down significantly, feeding more answers and better explorations of characters. Before Cyrus met Alice, he was serving a man in Agrabah. Jafar came looking for him, and his first master saved him by wishing him to be far away…landing him in Wonderland. In the present, Alice concocts a plan to find Cyrus by digging up his bottle and making a wish, summoning him to the location. After a mishap getting across a body of water, they make it to the burial, only to discover Jafar searching the location. Alice reveals that she suspected the White Rabbit would betray her, and falsely mentioned a fake location in case he did. However, at the real location, the bottle has already been dug up…and Alice wonders if Cyrus dug it up himself and moved on. Cyrus sends Alice a message letting her know he’s still alive, though, prompting her to continue the quest. Meanwhile, we learn that the Red Queen also learned the real location from the White Rabbit, who she has working with her against his will. She uses the bottle as leverage to get on more equal ground with Jafar. It’s becoming abundantly clear that, beyond the central Alice/Cyrus love story, Once Upon a Time in Wonderland is about lovers lost at its core. It hasn’t been spelled out completely—and there’s no reason to think the show won’t throw us curve balls—but there are enough hints that each character is being driven by their past history with a lover. Will has the enigmatic Anastasia, we learn the White Rabbit had (has?) a wife while also having something at stake, and the Red Queen wants to change the laws of magic, which consist of no killing, changing the past, bringing someone back from the dead and making someone fall in love. We’ll learn if this theory holds up in the coming weeks, but even at that, “Trust Me” remains thoroughly entrenched in the love story. The pace of “Trust Me” is significantly slower than the jam-packed and often-rushed premiere, almost to a fault at times. But while it’s a relatively anticlimactic hour of television, it definitely works as a piece of the grander scheme. As Wonderland is, as of now, still just a limited run series with an endgame not far off, answers and hints to answers are being slowly delivered at a competent pace. 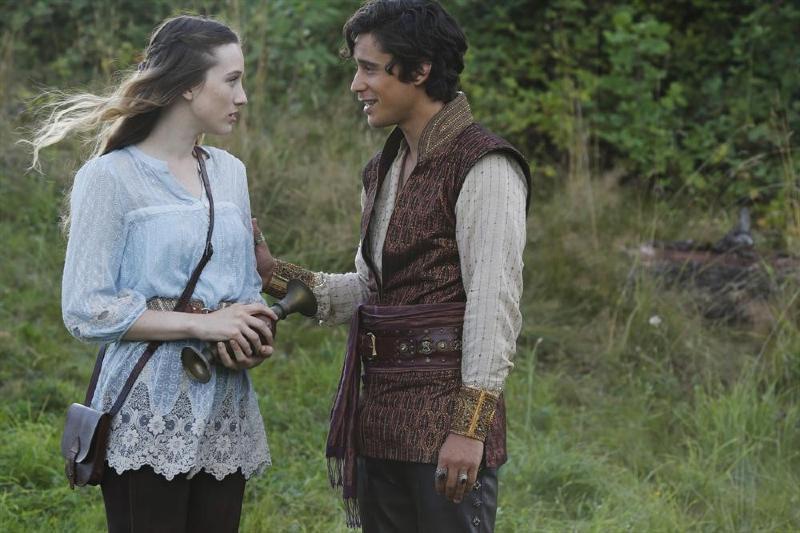 We know a teensy bit more about Will’s misdeeds, the White Rabbit’s allegiances, the Red Queen’s and Jafar’s “partnership” and how Alice and Cyrus ended up where they are. That last part is imperative, as the rushed summary of the show’s most integral love story in the pilot was a weakness. We do get the feeling that Alice and Cyrus were together for much longer than originally suggested, and this week’s scenes of Alice sacrificing her wishes for a life with Cyrus gave some much-needed weight to their love story. It’s still a simple fairy tale love story, which is acceptable on the show, but that there’s a sense of more possibilities to explore helps ground it. Admittedly, their flashbacks aren’t terribly interesting on their own, but the seeds of doubt and effective ways of delivering exposition are appreciated. Alice herself is quite interesting here, as she’s presented as this amalgam between the clever, imaginative Alice of old and the more recent Tim Burton-eque swordfighting Alice. Her bait-and-switch with the location of the bottle is great moment of ingenuity, as is the fact that she already finds out about the White Rabbit’s treachery and isn’t even phased by it. But we also have her putting a sword to the Mock Turtle’s throat to ride it instead of, well, asking it for help. But while many of the “level in badass” upgrades damsel-types often get in reimaginings tend to be for the sole sake of cheating a creation of a “strong woman” character, Wonderland is actually working to justify Alice’s more hardened tendencies. Her interaction with the Mock Turtle is followed directly by a flashback where Alice openly admits to preferring creativity over swordplay, and presumably only decides to learn it because it’s another fun thing to do with Cyrus. The Alice in the flashback is perfectly content, and has no real reason to learn how to fight other than for the sake of learning, like learning to play a sport without any intention to go pro. It’s a coincidence, then, that the worst moments of her life happen after she learns more aggressive and direct ways to project her anger. In addition to losing the love of her life, “Trust Me” also heavily establishes just how bad things turned out for Alice and her father. What was initially presented as a girl trying to prove herself to her daddy last week is now shown to be a much more piercing sense of betrayal. If anything, Alice’s father turning his back on her and throwing her in an asylum (you know, the one with the lobotomy) might be a bigger character moment than the Cyrus stuff, which itself is an intriguing subversion on the show’s entire concept of lovers lost. Yeah, having a character with daddy issues is a tired trope, but its surprisingly quiet treatment in this concept, and the focus being on the love lost rather than the scars themselves, is the path less traveled. The most interesting stuff in the episode, surprisingly, is the evolution of the Red Queen and her “partnership” with Jafar. Emma Rigby’s Red Queen was one of the least interesting characters last week, but Rigby takes the cake for being most improved from her introduction. She certainly gets to show her range, as the Red Queen gets her own rather empowering min-arc. There’s a slight tinge of abusive relationship parallels between Jafar and the Red Queen that the show doesn’t really take as far as it could, but where it stops still works. Firstly, we learn that she still has a weird sense of respect and honor; she isn’t exactly good at her job and does little to help the people she rules over, but she still feels obligated to hear them out. Jafar has no issues with murdering a room full of people to her horror, simply to his own ends. She’s definitely spoiled and selfish in her own right, but she does seem to have the slightest care for the greater good, so long as that greater good doesn’t interfere with her desires. Hopefully this quality will be explored as the series continues, as Rigby is at her best when she plays the dichotomy of being a villainous queen but not an evil one. We also learn that her motivations are likely something specific, as her goal of working with Jafar is revealed to be changing the laws of magic…laws which are specifically spelled out to us in the same episode. Also intriguing is how little her minions do for her; she’s the queen of Wonderland, yet she still feels like she’s on her own to come up with schemes to thwart Jafar and gain the upper hand. It’s always interesting when a man and woman in positions of power have secret games of chess while remaining in a partnership, even if it’s not on the same level of, say, the husband/wife wars on Breaking Bad or Scandal. While Wonderland‘s whimsical tone and inherent goofiness keep it all feeling rather light, there’s plenty of very dark stuff happening, especially in the minds of the characters. For the most part, there’s a surprising lack of action compared to the premiere. However, that leaves room for lots more low-budget character stuff, and after such a big premiere, something smaller was much-needed. This is an extremely tightly-focused show so far, but to the show’s benefit; it’s not a complex story, but as long as it continues to tell it competently, it will be entertaining. While this may not be the most talented cast on TV, everyone seems to enjoy being there and taking things as seriously as possible. That’s a must in a campy, even kid-friendly show like this, and it allows for more wiggle room to be messy or not-entirely new if it tells its story well. And so far, it is telling that story well. I like that the White Rabbit narrates the recap. It feels much more like a children’s show, which normally wouldn’t be a good thing, but in this case having that feeling grants a better ability to suspend disbelief. The overindulgence of CGI is not present this week, thankfully. That said, the island/Mock Turtle was a fairly cheap looking practical set, while the turtle’s CGI head didn’t look too bad. One thing that’s bothersome about the Red Queen/Jafar relationship is that the one overtly ethnic main character is the least sympathetic and most villainous so far, and the privileged white royalty is slightly more heroic. The Once universe has done quite well at giving lots of good material to its female characters, but it’s still not too ahead of the times when it comes to the race issue, even if they’re just unfortunate implications from usage of the source material. We get the four laws of magic, but it must be specific to wish-granting magic…right? Because plenty of people have killed with magic. Jafar does in this very episode. Unless there’s some specific workaround, or it’s classified as “dark magic” that comes with more consequences, or something. Genies and silver don’t mix. Genies are werewolves? It’s cheesy, it’s punny, and it’s childish, but by god the “We’re taking the ferry/fairy” bit had me in hysterics. “We wouldn’t want you to overcook water.” This show struck gold by casting Naveen Andrews.